The Oberammergau Passion Play is performed every 10 years in an open-air theater set against the beautiful backdrop of the Bavarian Alps in the town of Oberammergau, Germany. 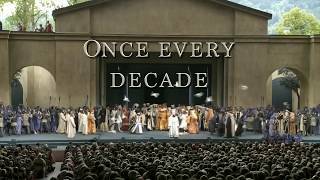 Don’t miss the 42nd production of this world-renowned play, performed every decade since 1634. Space is very limited, contact us today to reserve your spot for the event of the decade! Click here to discover group tours that are available to join. If you would like ideas for customizing your own group tour, click here for sample itineraries. Fill out our contact form if you have any questions or would like more information about creating your own group tour. Oberammergau is a town of approximately 5,000 residents, located about 1 hour outside of Munich, Germany. The picturesque village is surrounded by the majestic mountains and meadows of the Bavarian Alps. Not only famous for the Passion Play, the village is also well known for its intricate woodcarvings and Bavarian frescoes painted on many of the homes and buildings. The charming village boasts uniquely artistic facades as its inhabitants combine history, art and tradition with devotion to their region and hospitality. The town has been made famous by its performance of the Passion of Christ every decade since 1634. The history of the Oberammergau Passion Play began in 1633, as the Black Plague rampaged through Europe. The residents of Oberammergau vowed to God that if their town was spared, they would perform the Passion of Christ every 10 years. A play of life and death, promised in a moment of mortal threat, began the history of the Oberammergau Passion Play. The town was spared, and they have been honoring this pledge from generation to generation for 386 years. In 1633 the Black Plague rampaged through Europe, killing thousands. For months, the small village of Oberammergau managed to keep the dreaded disease at bay, mainly because of its remote location in the Bavarian Alps. Eventually the epidemic struck the nearby town of Ettal. The people of Oberammergau, however, controlled the spread of the disease by keeping close watch and preventing strangers from entering their village. Alas, late one evening, a villager who had been away, homesick for his family, strolled back into the town and unknowingly brought the plague to his people. Within a few months, 84 villagers had died. In July of 1633 the survivors gathered and made a solemn oath to God: if He spared them from further deaths, they would perform a day-long play depicting Jesus’ death and Resurrection every ten years. According to the story passed down through the generations, God heard them and there were no more deaths. In 1634, the townspeople performed their Passion Play for the first time. Eventually their vow was adopted by their children and their descendants. To this day, the villagers of Oberammergau have kept their promise virtually unbroken. The next Passion Play will be in 2020. Performed 5 times a week from May to October, this event of the decade will be attended by thousands of people from around the world. Space is filling quickly. Contact us today to secure your place for this once-in-a-lifetime opportunity! The passion play will run from May 16th – October 4, 2020. During these months, the play is performed 5 days per week in an open-air theater which seats about 4,700 people. All participants in the play must be residents of Oberammergau. Over 2,000 citizens are involved including acting, singing, musicians and technical support. There are 124 speaking roles, a 65-member orchestra, 48-person chorus and hundreds of people involved in the back end including stagehands, seamstresses, firemen, auditorium attendants and more. Male actors grow out their hair and beards to look more authentic and costumes are handmade. The play is held May through early October. During this time, the play is performed 5 days per week in an open-air theater which seats about 4,700 people. The play is performed in German, but that doesn’t seem to stop people from all over the world from coming to experience this incredible event. It is anticipated that over 750,000 people from all over the world will attend the play in 2020.